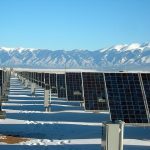 India may levy up to 25% tariff on imported PV cells and modules, according to the investigative report on safeguard measures released by India's Directorate General of Trade Remedies (DGTR). In the short term, the proposal will have a noticeable impact on the market’s price quotes, but its impact on the country’s overall market status will be limited, as the tariff’s impact will still hinge on the change of Europe’s trade barriers against China. In the wake of the rollout of India’s protective-tariff policy which was announced in February, the DGTR, following a half-a-year investigation, released an investigative report on July 16 suggesting a levy of 15-25% protective tariff for two years. Developing nations on the Notification No. 19/2016-Custom (NT) list will mostly be exempt from the tariffs, including Vietnam, Thailand, the Philippines, Mexico, and Turkey. Despite appearing on the same list, China and Malaysia will not be exempt from the tariffs, due to their high shares in the exports to India. Whether the DGTR’s suggestions and tax rates will be implemented will depend on the final decision by the Indian government. It is clear from the table above that India's local module capacity is not enough to meet its domestic demands, which explains its heavy reliance for PV modules and cells on imports, especially that from China. According to EnergyTrend’s Custom Data Report, more than 80% of India's demands for PV cells and modules in 2017 was met by Chinese suppliers. The proposal by India in Feb. 2018 to apply a 70% safeguard tariff for 200 days has overshadowed the market’s mood. 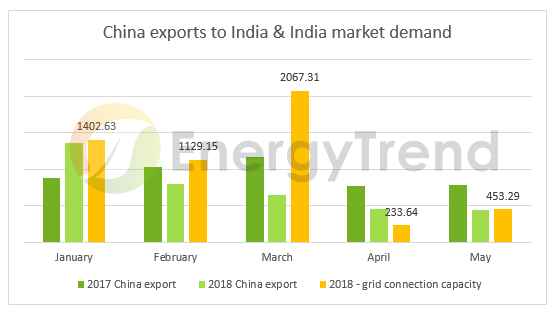 In the first five months of 2018, China's export volume for India plunged by 19.6% year-on-year, a sharp contrast to the 45% growth for grid-connected installation volume in the first half, indicating a drop in China's market share in India. In 1H18, China’s share of exports to India is still the highest compared to the other export countries. The two-year 15-25% safeguard tariff proposed by the DGTR is meant to create a development room for domestic capacities. 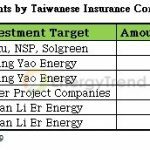 EnergyTrend, however, believes that as the tariff is not particularly high, its effect on protecting domestic capacities will be limited; in addition, the tariffs will increase the costs of local developers for large-scale PV power plants, to the detriment of such projects. In 2H18, the demands in India will reach only 2-3 GW, which is lower than the first half, with the whole-year’s demand expected to reach 8-9 GW, similar to 2017. The shipments of Vietnam and Thailand, module capacities totaling 9 GW, are both expected to stable. By contrast, China and Malaysia’s shipped products will be subject to the levy of deposits at customs. As a result, only the suppliers with the higher financial strength and steady orders will retain their interest in India. In general, given the policy’s uncertainties and absence of large demands, a rush for goods is unlikely. 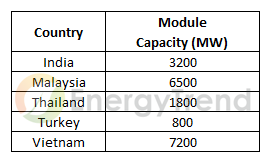 Presently, the prices for multi-si modules in India are in the range of US$0.25-0.27/W, which is lower than the other overseas markets, where the prices are higher than US$0.27/W. With their higher price, the first tier multi-si manufacturers in China will prefer giving priority to markets other than India. The difficulties facing the second- and third-tier Chinese suppliers that rely on exporting to the Indian market due to China’s harsh market situation will be further aggravated by the protective tariffs. This will cause the market’s prices to fluctuate further. Given the uncertainty on the implementation, actual rates, timing, and retroactivity of the proposed tariff, there will be fluctuation in quotes on the market in the short term, and the supply-demand mood in the second half will be similar to the first half. A major factor worthy of notice for market development is whether the MIP (minimum import price) scheme in Europe will expire on Sept. 3, as scheduled. Thanks to its brisk recovery, the European market’s demands are expected to jump by 35-40% in 2018.